Comfortable and Serene- Close to Town! Great Location! 1 bedroom beautiful cabin. Wooded lot. New Hot Tub! Location is everything! This comfortably designed 2-story log cabin is conducive to relaxation and experiencing Smoky Mountain living at its best. From the rustic hardwood floors, open beam ceilings and stone fireplaces, you'll feel like you've stepped into a wilderness wonderland. Enjoy a home-cooked meal in the fully equipped kitchen with dining area, or snuggle up with a good book in front of the fireplace-there are two of them! When you're not hiking in the hills or taking advantage of the nearby shopping in Gatlinburg, engage in a friendly game of pool or foosball. Unwind on one of the two decks or indulge in a nice long soak in the New, covered, Spa Crest outdoor hot tub. The master suite features a king-sized bed, an oversized Jacuzzi tub and fireplace. This 'High Haven' retreat is less than 5 minutes from the heart of Gatlinburg and entrance of National Park. Guest have full access to the 3 separate Chalet Village Clubhouses where summer time swimming and tennis are available. 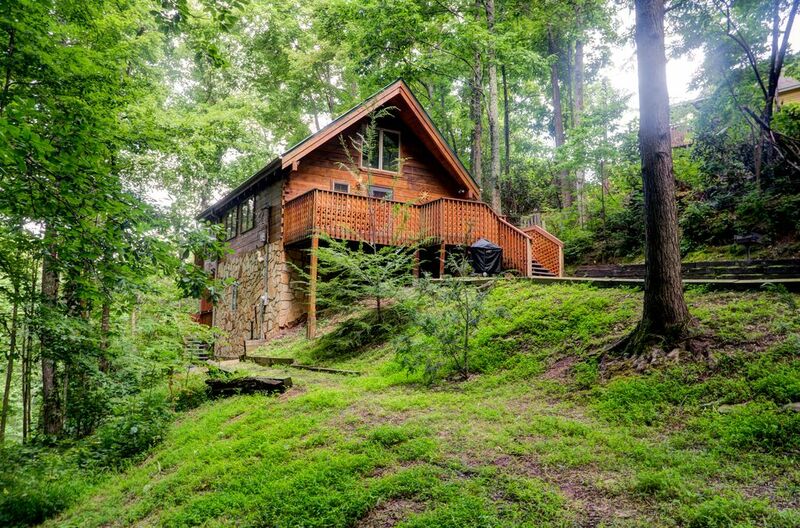 High Haven cabin is located at light number #10 off Ski Mountain Road and less than 5 minutes from downtown Gatlinburg. No need to worry about parking; our driveway is nearly level and accessible throughout the year - there's enough room to park 2 cars side by side. Additionally, the terrain around our cabin is safe enough for the kids to explore. We are sure whether you are with family, friends or newly married, that High Haven will become your home away from home. Come and enjoy a restful weekend at our little piece of perfection in the Great Smoky Mountains -- See you soon! All mattresses/pillows are protected against allergens. We provide quality bedding to ensure a peaceful comfortable rest. Full size top loading washer and dryer. One fireplace on the Main level of the cabin in the living room, and one in the Master Suite. These are gas log fireplaces operated by the simple turn of a timer. The driveway is nearly flat. There is ample room for 2 vehicles side by side. A limited number of towels and wash clothes are supplied. It is suggested that you bring extra towels for the hot tub and/or swimming. TV, Pool Table, Foosball, Fireplace. It's comfortable. Basket Filter Style. Bring your own basket filters and coffee. Kitchen is equipped with all of the basic cooking utensils. If something specific is needed, please inquire with us. Cable/Wi-Fi Service provided by Spectrum. We do have some family board games for our guests to enjoy. Some areas of the deck are sheltered from the rain. We also have what’s been described as a Lanai, which offers even more “outdoor protection” from weather and insects. Ober Gatlinburg Ski Resort is minutes from High Haven Cabin! Enjoy a round of tennis at the clubhouse! There are three separate clubhouse/pool locations within Chalet Village. Our guests are welcomed at all three! We have a new, very high quality, Spa Crest 601 Duke Hot Tub installed late August 2018. We have a contract with the supplier for regular "Deep Cleanings" which keeps the internal piping sanitary. Location to GSM and Downtown Gatlinburg just minutes away ! Very clean cabin and quiet . Feel like you are hidden in the woods ! Owners Phil and Kelly are great ! We will be back next year !!!! Phillip made the stay even better by answering questions and having everything clean and prepared. The cabin was very clean and cozy. Also had a great view. Look forward to staying in the future. My husband and I stayed here for my birthday weekend. The cabin is nice and clean. We were not far from the Gatlinburg strip. Mr. Foree checked on us to make sure we had everything we needed. We would stay here again! Happy belated Birthday Malorie!! Thank you for choosing us. I am delighted that you enjoyed the cabin. We too are looking forward to a stay in July of this year, and can't wait to get there. The location of the cabin I feel is absolutely perfect. It is very close to downtown Gatlinburg and allows for easy access up to Pigeon Forge via the bypass. You are always welcome to stay at the cabin, and thank you for taking the time to write a review!! My daughter and her boyfriend Kyle stayed at High Haven and had nothing but wonderful things to say about the home. Philip and his wife were most accommodating and have created a beautiful home full of extras! Philip always answered my questions and even help find a place for them to inquire about fishing. There home is relaxing and so serene. I would highly recommend there home to anyone who is looking to stay in Gatlinburg. Thank You!! I am so very pleased that your Daughter and Kyle enjoyed themselves at the cabin and exploring all that the area has to offer. It just makes me smile thinking about it. We do try to be very responsive and accessible to answer any questions, or be of any assistance that we can. Thank you for your kind words, and for taking the time to write a review. I will be looking forward to hopefully hearing from you again in the future! My husband and I spent our weeklong honeymoon and the chalet and absolutely loved it. We felt so comfortable and at home in the cabin. We can’t wait to return! Oh wow! I did not know it was your honeymoon week at the cabin! Congratulations you two! How cool is that? I am so super happy you enjoyed yourselves at the cabin and in the area. It is beautiful, and what a nice honeymoon that must have been. I'm looking forward to hearing from you in the future. Your always welcome to stay. The cabin was perfect! My husband and I enjoyed our time here so much. It was so clean & cozy. The location was perfect too!!! Philip was so easy to work with and answered all the questions we had quickly. We definitely plan to return soon! Hey Keri! Thank you so very much for taking a moment to share your thoughts. I can't thank you enough for choosing us. We know it's a choice, and we do not take that for granted. It is important to me to be available to my guests for questions or concerns. You are in many ways my eyes and ears while there. And yes, New stereo just installed! Your always welcome at our cabin!